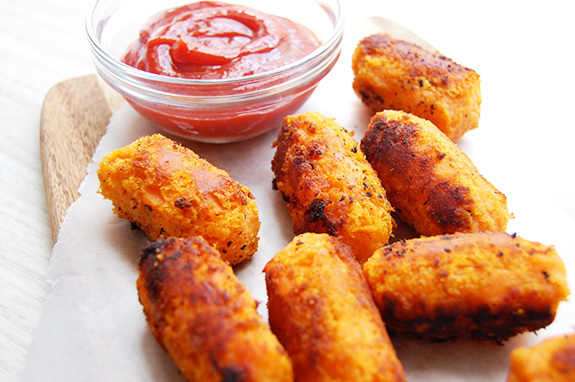 Sweet potato tater tots are the ultimate Paleo snack. They are flavorful and addictive, but still healthy for you. They are also inexpensive and keep well in the freezer, ready to go at a moment’s notice. Serve some as a side for juicy burgers, or as an after school treat. I tried making sweet potato tots three different ways to figure out the best process. I added the same ingredients to each of the three trials, but cooked the potatoes differently. For the first attempt, I grated raw sweet potato and tried to shape it into tots after mixing it with the onion, coconut flour, and assorted spices. (So the potato was not cooked first.) It was extremely unwieldy and hard to shape into tots. Once baked in the oven, this version was also very dry and fell apart. So, onto the second trial. For the second attempt, I once again baked the tots. However, I cooked the sweet potato first, as in the recipe listed below. I mixed the cooked sweet potato with the other ingredients and shaped it into tots. It was much easier to shape than the raw grated sweet potato. I put the tots on a greased baking sheet and baked them for 12 minutes at 400 degrees F. I found these to be a little dry as well, though they held their shape better than the first trial. The third time was the charm. As soon as I bit into this version of sweet potato tater tots, I knew I had my clear winner. First I cooked the sweet potato briefly on the stove. Once that was drained, I transferred the sweet potato to the food processor to make quick work of mashing it. Next I mixed in the remaining ingredients – I especially like the added spice the chili powder adds to the tots. Then, using my hands, I shaped the mixture into cylinders. Once again, the sweet potato was much easier to shape after it had been cooked. In this third trial, I fried the tots on the stove. I heated quite a bit of coconut oil in a nonstick skillet and fried the tater tots until they were golden, using a spatula to rotate them in the skillet. They turned out perfectly crisp and delicious. 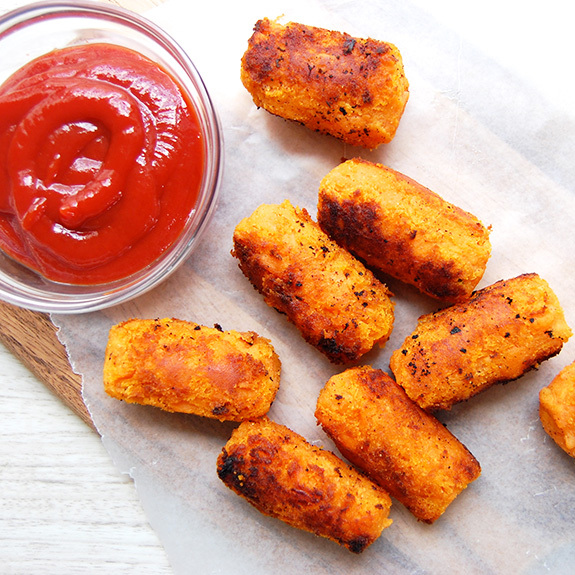 These sweet potato tots are an ideal freezer snack. Simply place the shaped tots onto a cookie sheet (before the frying step), freeze until firm, and then transfer to a resealable bag and store in the freezer. They are perfect for pulling out for after school or as a quick side dish to dinner. Tater tots seem like junk food, but this version is actually healthy for everyone. Serve them with homemade ketchup or a creamy mustard dipping sauce. Bring a large pot of water to a boil. Add the sweet potatoes and cook for 5 minutes. Drain and rinse with cold water. Shake off any excess water. 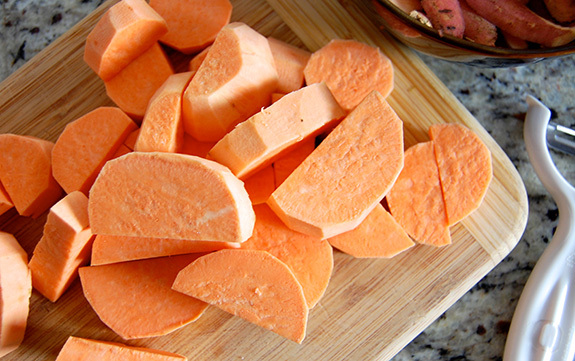 Place the sweet potato and onion into a food processor and pulse to break down into smaller pieces. Transfer to a large bowl. Stir in the coconut flour, garlic powder, chili powder, salt, and pepper. Stir well to combine. Use your hands to shape the potato mixture into small cylinders. Place aside until ready to fry. Heat the coconut oil in a heavy skillet until hot. Working in batches, add the tater tots to the skillet and fry until golden brown, turning carefully to brown each side. Once crispy, place onto a paper towel-lined plate. Repeat with the remaining sweet potato mixture. Serve warm. Thank you for sharing your experiments and what happened. That is so helpful should we ever wish to experiment. These would be delicious, and I have sweet potatoes on hand, so perhaps will try them tonight. Would this work if you used a deep fryer and lard? Coconut oil has a smoke point of just 350°F, whereas lard has a smoke point of 413°F. Hi Jake, I am really not sure, sorry. I do not have a deep fryer. When you say 2 large sweet potatoes could you not include a weight to help determine what a “large” concept might be? I find thatrecipes including sweet potato are all written this way and I’m just not sure of the quantity needed. I just tried these. The flavor was excellent and I ate to many! My only issue though is they do fall apart fairly easily while frying. I changed the shape from tater tot shaped to small patties about $1 piece and that seemed to work better. I also have some in the freezer to try from a frozen state. Do you think that maybe adding an egg to the mix would help it stay together better (or would that make it to ‘eggy’) or rolling them in almond or coconut flour before frying? Any other ideas to help keep them together a little better? Those do look good & I bet the kids would love them too which is an added plus! I love the cookbook I downloaded for $27…the recipes are mostly wonderful…I live at a very high altitude, so some baking has been difficult…I wish I could cook like this all the time (and I am trying to) but my husband wants other (bad for you) stuff too. I also appreciate the recipes I can make and freeze for later…I can cook all day one day and eat most of the week on those things. Thank you for this wonderful website. I’m new at all this, but I just finished telling my husband that sweet potato/white potato isn’t allowed at all. While I was happy to find this recipe, I’m confused as to can we really have this? Also….what about whey powder. Mine is 25 gr protein, no carbs or fat. Can I use it in recipes? Made these for lunch. LOVE the flavor. I need more practice in forming the tots though. Might have to try the patty idea someone else mentioned. But, will definitely make again! Thanks! Just tried making these. They were a little tedious but I am totally willing to put in the work for tasty food. I froze them because they were very soft and just mushed together otherwise. They eventually fell apart while I was frying them. I didn’t get tater tots but I did end up making “hash browns” with them. Excellent flavor!! Going to play around with the recipe. Mine fell right apart 🙁 I ended up putting it all on a cookie sheet and broiling till the top crisped up. The flavor was excellent, but I’d like to know your secret to getting them to stay together for frying. I want to add bacon to these. Yum. Can only coconut flour be used ? Yes, like Debra I’d like to know what can be substituted (if anything) for the coconut flour. 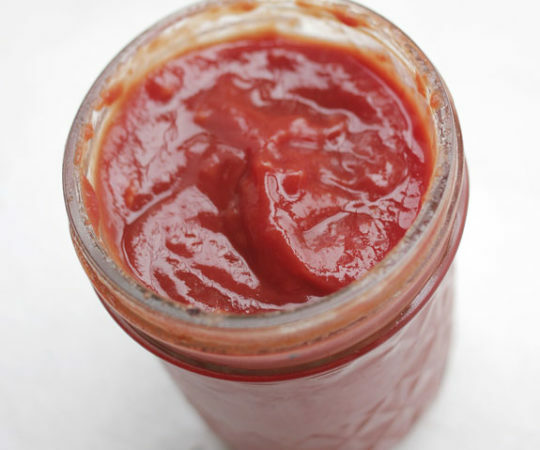 I was hoping you would also provide the recipe for the homemade ketchup. Can you help me with that? Thanks!